PHUKET: Foreign diplomats representing at least six countries are to meet Tourism and Sports Minister Chumpol Silpa-archa to address the growing problem of cheats and swindlers targeting Phuket tourists. The news was reported through state news agency the National News Bureau of Thailand. 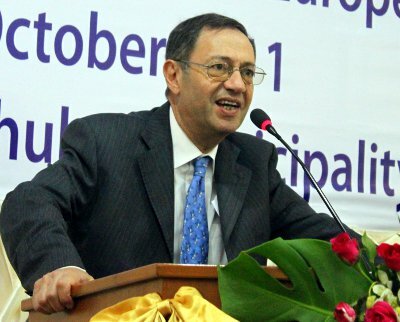 Tourism and Sports Ministry Spokesperson Watchara Kannika announced that EU Ambassador David Lipman, Head of the Delegation of the European Commission to Thailand, and the ambassadors of six countries, including Poland, Austria, Switzerland, Finland and the Netherlands, are to meet Mr Chumpol to brainstorm a solution to the increasing problem of tourists being cheated and swindled in Phuket. Mr Chumpol said that the problem of tourism cheats operating in Phuket has become an international issue that calls for immediate action. The most common rip-off schemes that tourists face include overpriced products and services, low-quality products, low-standard services and exaggerated damage claims on broken items, said the report. Meanwhile, the Tourism and Sports Ministry will launch a blacklist of jewelry shops that sell low-quality items at inflated prices, it was announced. The names of such shops will be put on the website of the Ministry of Tourism and Sports as well as that of the Department of Tourism. The Tourism Authority of Thailand has also been instructed to inform its overseas offices regarding this issue, said the report.